Dip your spoon into the latest limited edition Ben & Jerry’s ice cream flavors: ClusterFluff and Schweddy Balls. Given Wal-Mart’s stance on rude music lyrics, I was kinda surprised to see Schweddy Balls make it to the WallyWorld freezer cases. 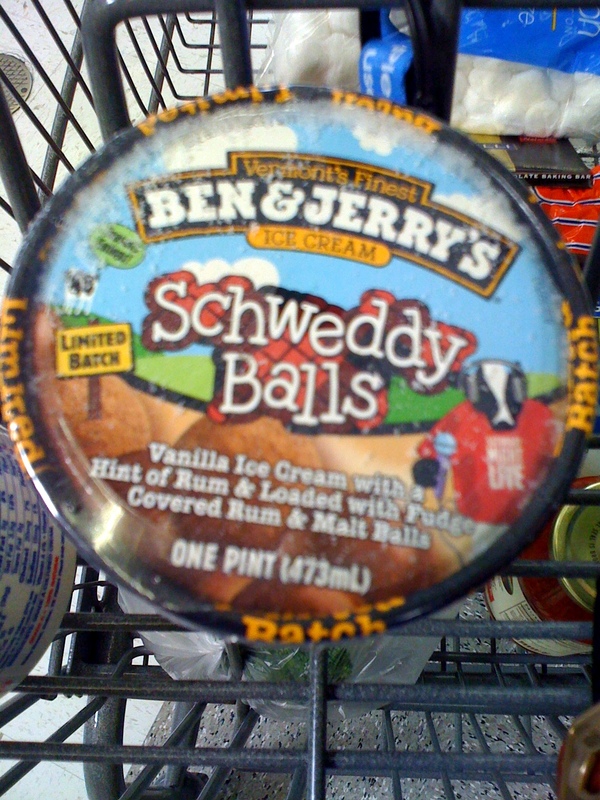 Frankly, Schweddy Balls isn’t the best B&J flavor ever (that would be Seven Layer Bar, in my humble opinion). The chocolate covered rum balls are tasty, but the frozen malted milk balls don’t taste like much of anything. Clusterfluff, which I haven’t sampled yet, sounds promising: peanut butter ice cream with caramel clusters and a marshmallow swirl. I have tried Cluster Fluff and I can confirm that it is delicious! Have also seen the (newish) Red Velvet Cake flavor…not sure that I’d like it as an ice cream.